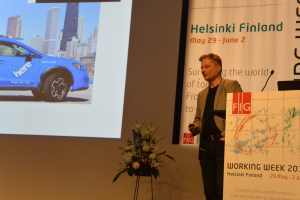 FIG Working Week 2017 was held in Helsinki, Finland 29 May - 2 June. Digitalisation version 2.0 was on top of the agenda both at the plenary presenations and in the over 80 various sessions during the conference days. The future was already demonstrated in the conference bag that was handed out to all participants. The bags were chosen because of sustainable responsibility, a CSR bag, caring for the environment that include human rights, discrimination, child labour, working conditions and a sustainable fabric. 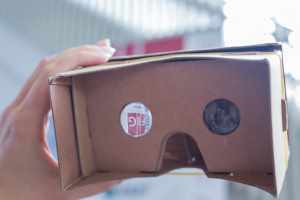 Inside the bags was another futuristic sign, a set of Augmented Reality (AR) card-board glasses that – once sampled – opened up to a virtual world of wonder. The logo of the conference was beautifully combining symbols of Finland – the trees, the water the sun the northern light with the symbols of the future in the digital world with the grid and the 1 and 0’s. 1400 participants found their way to a cool but beautiful Helsinki. 90 countries were represented at the Working Week to get closer to what the future brings for surveyors. There were many ideas on this in both the plenary sessions and the 400 papers presented in 57 sessions. The Working Week and its many activities can be confusing for those who attend for the first time. About 2/3 of attendees have attended previously and many know each other across the globe, but for the 1/3 of the attendees it can be both overwhelming and difficult to find ones way. Therefore a new initiative was the Newcomers Session that took place in the morning before the Opening Ceremony. This session gave an insight into what FIG is and also how to navigate through the many offers during the packed week. Around 70 fresh newcomers found their way to this session. The Northern Light glowed on the sky until the sun took over and rose over Finland while Finlandia by Jean Sibelius was beautifully played by Cello and Piano to mark the opening of the Working Week. There could not have been a more Finnish, beautiful and moving way to open the three busy conference days of the Working Week. 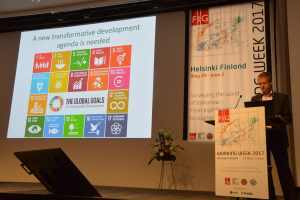 The Opening Ceremony was introduced by Co-Conference Director Pekka Halme who had been in charge of the Local Organising Committee, followed by Mr. Jari Leppä, Minister of Agriculture and Forestry. Ed Parsons, google was key note speaker in the opening ceremony talking about Digitalisation – version 2.0. He stated that: "Talking about this idea Digitalisation version 2.0 the key point here, I think, is that we must make the most of the opportunity that these technologies give us. And that means not just taking an existing process and making a digital version of that. That’s kind of where we have been a little bit in the past. But to use the opportunity that geospatial technology provides us to come up with a completely new way of doing things. That is what I’d say Digitalisation version 2.0 is. The first version of a digital process was to take the existing process and make a computer version of that. What we have got the opportunity to now is to look at these new technologies and say, well are there just completely different ways of doing things?” This Digitalisation version 2.0 will have a significant impact on the surveying profession. The General Assembly decided to appoint Paul Munro-Faure, FAO, FIG Honorary Ambassador, and he received his certificate at the opening ceremony by President Potsiou. Paul Munro-Faure has for many years had an active role within FIG, both in commission 7 and by linking close ties between FIG and FAO, especially in the work on the Voluntary Guidelines, VGGT. Paul Munro-Faure stepped down from his position as deputy director of FAO in Spring 2017. Inthe acceptance speech of Paul Munro-Faure, he said: 2017 is thirty years from the date when I was appointed as United Kingdom delegate of Commission 7 by my member association, the Royal Institution of Chartered Surveyors, RICS. 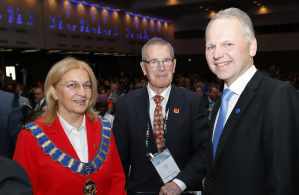 It is twenty seven years from the date of the first FIG Congress I attended; Here in Helsinki under President Juha Talvitie. It was a remarkable Congress; A transformative event. The FAO and FIG relationship was formalised in 2002 when President Bob Foster joined me in Rome for the signing of the Memorandum of agreement between our two organizations." The three plenary sessions were a source of inspiration and responding to the theme of the Working Week: ‘Surveying the World of Tomorrow’ with the three sub themes: 1 Living of Tomorrow – In a Digitalised World,2. Professional behaviour – In a Digitalised World and 3. The Contribution of our Profession – In a Digitalised World. Arvo Kokkonen, National Land Survey Finland, raised the question if the surveying sector is changing quick enough? He predicted a future with “many players in the field” as land information will be even more recognised as part of the basic infrastructure. Greg Bentley, Bentley Systems, had a fascinating keynote on ‘Going digital: reality modelling advances surveying, and engineering…’. According to Greg reality modelling will go mainstream, and future key words will be: “Conceptioneering”, “Constructioneering”, “Inpectioneering” and “Productioneering”. Oumar Sylla, Global Land Tool Network, highlighted in his keynote the relevance of land information as key ingredient for realising the sustainable development goals. Tenure security for all is one of the goals where surveyors worldwide play a vital part in it. Robert Guinnes, Finland, brought future trends in pervasive positioning – accuracy, availability and reliability of GNSS will increase. Yola Georgiadou from ITC, Twente University, had a highly interesting contribution on geo-ethics, which may have been an eye opener for many – what does ethics and surveying have to do with each other? Most likely not many have thought of this perspective. Jolyne Sanyak, Landesa, presented ‘How can we favour secure land rights for the digitalized world we want?’ She explored innovative and more affordable technology and how to democratize data gathering. Markku Poutanen went back to the ’origin with a very nice overview of the future of reference frames. Fredrik Zetterquist wondered if we embrace the global transformative forces – with a showcase on cadastral procedures conducted by the citizen. Juha Hyyppä finalised his presentation dramatically by stating "Change or Die"
Centrally placed in the conference centre, a Historic Map Exhibition was presented. A Historic Mercator map showing the Nordic countries was one of the maps in this special exhibition. This map was part of Geradum Mercator’s series of regional maps and was part of the first atlas of the world. This atlas was published in 1595, the year after the death of Mercartor. The map was bought by National Geodetic Institute of Finland in 2013. The variety of sessions was large spanning over all the areas of surveying. A new feature was the Inspirational Sessions (ISS) inviting presenters to give 5 minute inspirational speeches which in the last part of the session were basis for interesting and more in-depth discussions. These sessions were well visited, vivacious and provided a breeding ground for lively discussions. There were also several sessions organised jointly with the conference institutional partners, World Bank, FAO and UN-Habitat/GLTN. Hereto several meetings were held with members and stakeholders. The Working Week already started on Sunday 28 May with three pre events: BIM, History and Young Surveyors European meeting. All three events were well visited. The History Symposium offered several contributions from the Nordic countries and also from Serbia, Canada and Croatia. The Struve Geodetic Arc and the Enhancement From North Cape to Cape Agulhas in South Africa – the Longest Meridian on Earth were presented – highlights in Geodesy. Fascinating were the contributions on the surveyors in the Roman Empire. Two books by Swede Martin Ekman on Celsius and 500 years of Nordic Mapping were brought over by FIG Vice President Mikael Lilje. The BIM for Surveyors Workshop attracted more than fifty professionals and academic engineers from 27 countries. Building Information modelling is the key for the implementation of digital models and processes for the construction industry. The workshop showed that surveyors play a crucial role in BIM design and implementation: managing project and asset data with proper coordinate reference systems, linking the construction project to GIS, measured surveys of the built environment using terrestrial laser scanners, setting out and machine guidance, linking virtual building models to land management, tendering and costs. Surveyors make BIM work properly. Again in 2017 FIG Young Surveyors successfully had their Fifth FIG Young Surveyors European Meeting. They also organised various sessions within the overarching FIG Working Week. Merging those two events allowed young surveyors from all over the world to participate and experience the full range of FIG events and activities. The atmosphere was energetic, and the participants shared news and reports on their activities, research and work. The highlights got shared through the YSN social media channels, allowing young surveyors all around the world to join and interact. 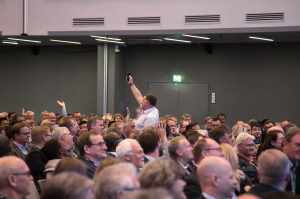 22 exhibitors found their way to Helsinki and the Working Week showcasing their latest products, machinery and technology and there were lively discussions around the exhibition area that was also used for lunches and coffee/tea breaks. 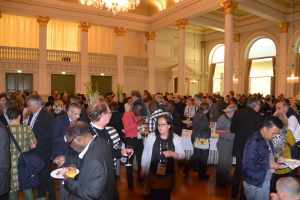 The social events and other activities outside the session rooms are also of great importance for the networking between the participants which is also a cricial part of the participation at the Working Week. The possibility to talk fid and find others from around the world with similar challenges, or ideas that are worth bringing back home. City Hall of Helsinki was the venue of the Welcome reception with City of Helsinki as host of the event. FIG President Potsiou thanked the City and Mayor for this very kind gesture, and expressed thanks to NLS and the Finnish Associations, MIL and MAKLI for bringing the Working Week to Finland and Helsinki. 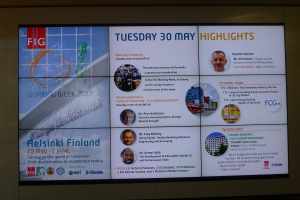 Helsinki is a very interesting example of city development – the planning actually in cooperation with Bentley Systems. 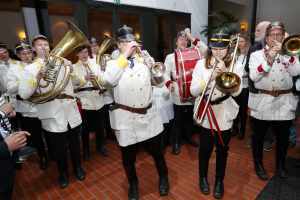 The Finnish evening which is also the FIG Foundation/Trimble dinner included several surprises such as welcome incl military brass band, Kahden Pennin Orchester and finally the nice evening ended with a Finnish rock band playing heavy rock that could fill up the dance floor with all kinds of nationalities. The Gala Dinner took place in the famous Finlandia Hall Foyer. 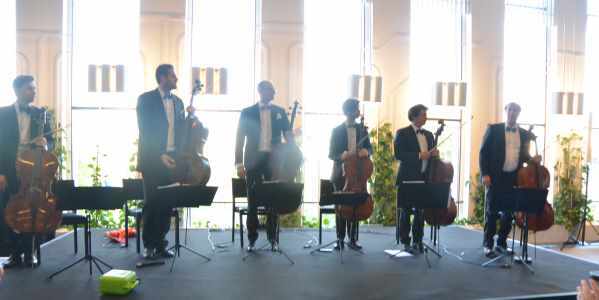 A spectacular Cello Ensemble entertained spanning from Sibelius to a piece of music on the Formula 1 race with the Cellists both playing and performing. Before the Gala Dinner the Young Surveyors together with other youngish-feeling participants, in total 129 fresh surveyors found their running shoes and participated in the Charity Run organised by the Young Surveyors. The Charity run took place in Töölönlahti park. In total the Charity Run collected 1,290 EUR that will be equally shared between FIG Foundation and Humanitarian Open Street Map. At the Closing Ceremony FIG President Potsiou thanked all involved in the preparations and execution of the Working Week. It was a busy week with many and varied activities, and President Potsiou stated: “our role as “change agents” is critical if we are to bring these concepts and tools into concrete actions”, referring to both the work done by the FIG Commissions, Networks, Permanent Institutions and Task Forces, and indeed also in the continued cooperation with World Bank, UN-Habitat/GLTN, UNGGIM and FAO and other UN organisations, working jointly towards the UN Sustainable Development Goals. 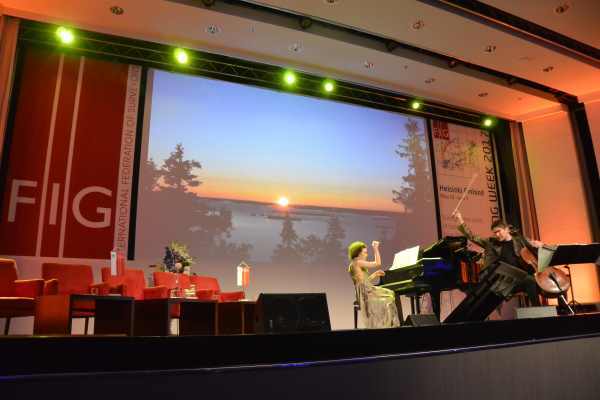 The days were long and the nights were short in June in Helsinki, which was an extraordinary experience for many participants - and the Working Week also brought long and action-filled days and short nights due to the activity level of the Working Week.